Duluth Lumber Co. dock, Duluth, MN. 1892 parts of her hulll were built into new tug, JD. MCFADDEN (US77041). 1870 Owned RG-Cobunn, Duluth, MN. 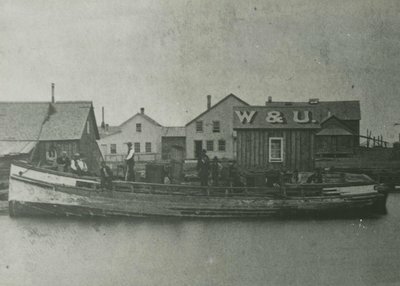 1879, Dec 22 Leaking; run ashore 63 miles northwest of Duluth, MN; salvaged. 1882 Jacob Hector et al, Duluth, MN. for fishing trade, Apostle Islands. 1885, Jan 1 New deck & upper works. 1888, Oct 26 Burned; last owners Cooley, Lavaque & Co., chartered to Jeffery Bros.